There will be no increase in tuition costs for Tusculum University undergraduate students enrolled for the 2019-2020 academic year after members of the Tusculum University Board of Trustees voted to freeze fees for the upcoming year at their recent meeting. 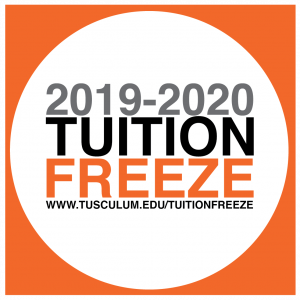 While many institutions seek to raise tuition annually, this is the second tuition freeze Tusculum has adopted in less than five years, last freezing fees for the 2015-16 academic year. “This freeze represents Tusculum’s ongoing commitment to both minimizing student loan debt and ensuring that a quality education remains affordable for our Tusculum students,” said Dr. Paul Pinckley, vice president of enrollment management and financial aid. For more information regarding the tuition freeze and Tusculum University, email admission@tusculum.edu or call 423-636-7312.